hey Jeff. I was reading up on this build as I am gonna go SOA probably this year. My question is how well do the 30+ yr old spring hold up to rock crawling? 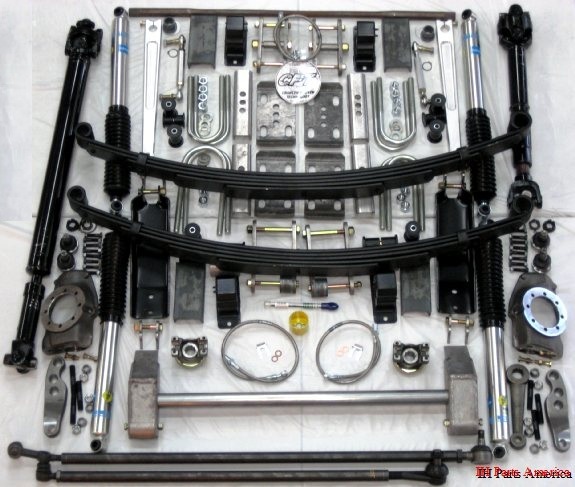 Did u re-condition/re-arch these springs in your build? Thx for your time. Do u sell replacement stock springs? Thanks for any and all input. The springs were used with only new bushings being installed. These older used springs hold up pretty good if they are in decent shape to begin with but of course any spring can get worked over and sagging in short order especially if the vehicle is heavy, the terrain is wicked or the driver is abusive. 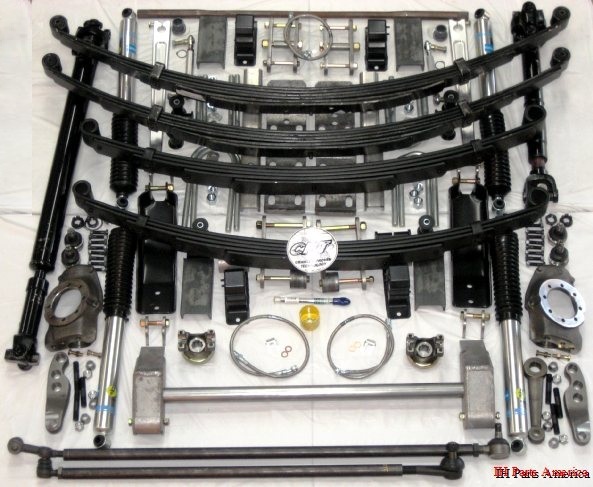 As for stock replacement leaf springs we are currently working on this and hope to offer them real soon if IHPA can afford the initial buy in. Last edited by ihpartsjeff; 10-23-2013 at 12:28 PM..
Can you tell us which pitman arm you used? It looks like a 6.5" long by 1.5" drop, is this correct? Sorry for the late reply. It is arm #2 on our online store. Is that front axle a Chevy Dana 44? Wondering cause the ubolts are uneven on the bottom like the Chevy axles. And if it is did you guys shorten it? Yes it was a GM/Chevy front Dana 44 axle and yes we did narrow it to Scout II width. 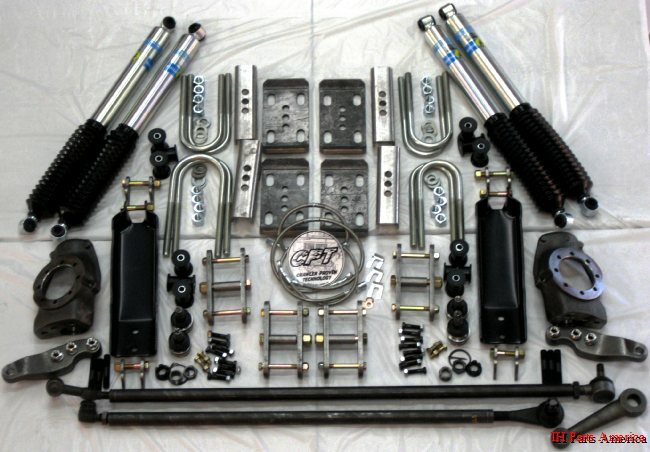 Been debating on how to go on my suspension. Between scooter, a few others and you Jeff, I'm sold on the SOA and rs. Just have to get my welding machine first then save for the kits. Thanks for your posts, pics and work Jeff! This rig looks great! Btw, has it sold yet? 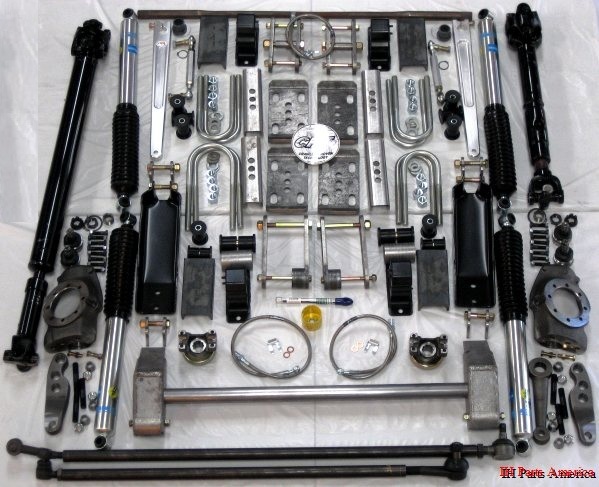 Several assortments of parts are available. Hi Jeff just have a quick question for you. I eventually want to do a SOA on my rig and when I do I am interested in using a Chevy Dana 44 like this one. I plan to narrow it and use Scout axles with GM outers and brakes. My question is I can't really tell from the pics but it looks like there May be a caster shim on the right perch in the pic. Is this a must? I guess I was thinking that since they were SOA from the factory that the pinion angle would be good to go. Please enlighten me with your wisdom. Thanks! The passenger shim is needed to increase pinion angle. Just because the axle is set up for SOA doesn't mean it will perfectly work in all SOA applications. With the Scout's shorter wheelbase and hence shorter front driveshaft more pinion angle is needed to avoid any ujoint binding. Once the pinion angle is set the driver side perch is welded in place to match the passenger side's new angle. Hi Jeff I forgot to ask last time. Do you recall what degree of shim you used on the passenger side spring perch and what the overall pinion angle was when shimmed? I'm sorry but I don't have an answer for you. This project was done so long ago that I just don't recall. My suggestion is bolt up the axle as is and then check your measurements. After that you can order the shim(s) from there. Takes a little longer to get done this way but overall will net you a better overall driving Scout. when you guys do this upgrade for 35" tires, is there any movement front to back of the axles to accommodate the larger tires? The rear axle remains in the same position as factory. 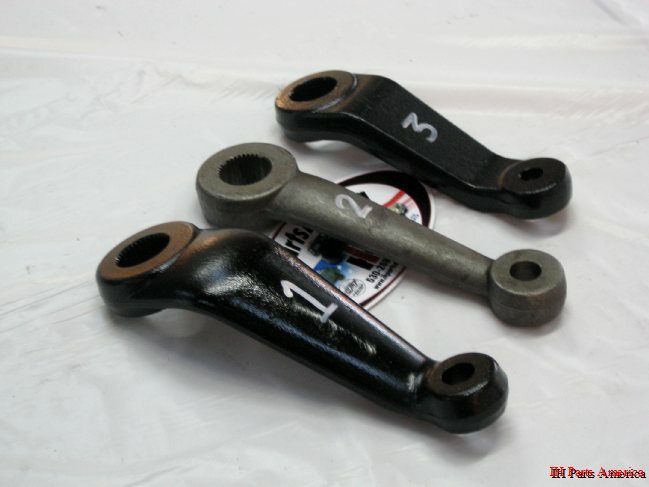 For the front, the position doesn't change except for the fact of the reverse shackle kit moving the axle forward an inch. Normally you don't need to move the axles for 35's as the tires center in the wheel wells pretty decent. If you have a decent amount of up travel you May need to install new bumpstops to keep the tires out of the top of the rear quarters/front fenders. Thanks.